Always attention to detail, technical skills, passion in our work and great attention to customer needs are the strengths that have allowed us to excel in the field of sale of 7 Pinstriping brushes Andrew Mack Serie Mack Tidwell Monster Stix. Consultando il catalogo di Aerografando you will immediately notice how vast it is and how diversified the model range is Brushes, you will find the best 7 Pinstriping brushes Andrew Mack Serie Mack Tidwell Monster Stix offers at the best prices on all 7 Pinstriping brushes Andrew Mack Serie Mack Tidwell Monster Stix of the brands Andrew Mack & Son Brush Co..
After more than a year of development, we are super stoked to have a hand full of the coolest and most versatile paint brushes we have ever offered. For this set, Jeral consulted with one of the most well rounded painters he has ever know... his wife Sarah. With her input, the set was elevated to a whole new level. This 7 pc. set is the next step in our collective painting evolution. Long lines, tiny details, smooth shading, and just plain ole rocking it out... these bad boys have got you covered. 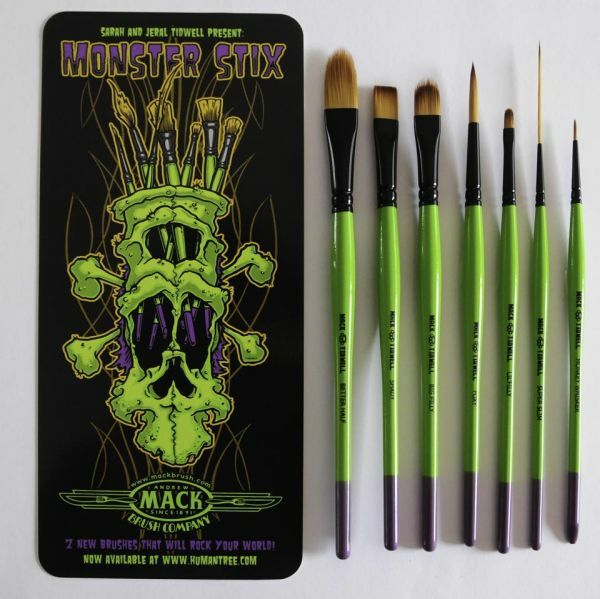 Read the reviews of our customers on 7 Pinstriping brushes Andrew Mack Serie Mack Tidwell Monster Stix of the category Brushes. Review 7 Pinstriping brushes Andrew Mack Serie Mack Tidwell Monster Stix of the brand Andrew Mack & Son Brush Co..
Trust in the quality and professionalism of Aerografando on the sale of 7 Pinstriping brushes Andrew Mack Serie Mack Tidwell Monster Stix, only from us you will find the best prices. You want to have more details on 7 Pinstriping brushes Andrew Mack Serie Mack Tidwell Monster Stix #M/T-MS or more generally on ours Brushes? You are looking for a Brushes but do not you find it in the catalog? Staff of Aerografando will answer all your requests.